Orysanol E provides a high amount of gamma-oryzanol and vitamin E, which stimulate muscle metabolism. This product is ideal to support muscle growth and development. 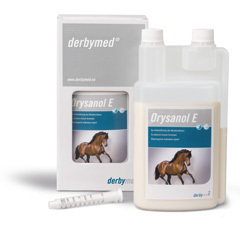 Orysanol E combines the effect of buiding up muscles triggered off Gamma-Oryzanol with the soothing characteristics of Vitamin E. Furthermore it has a proven effect on fertility in mares and stallions. Gamma-oryzanol is extracted from rice germ oil, and belongs to a group of natural sterols, which are well known to improve and support muscle development. Vitamin E fullfills an important task within the muscle metabolism: It improves the supply of oxygen and nutrients to the muscle cells and it supports the removal of by-products. Orysanol E is rich in naturally contained linoleic acid (30.0 %) and gamma-oryzanol (10.0 %). Because of the heightened content of gamma-oryzanol, the use of this liquid feed supplement should be discontinued 48 h before any competition or race.